Hip No. 138, a son of Cairo Prince consigned by Stuart Morris, Agent, was sold to John C. Oxley for an OBS Yearling Sale record $340,000 to top the Ocala Breeders’ Sales Company’s 2018 Selected Sale of Yearlings. The gray or roan colt is out of Minutia, by Concord Point, a half sister to stakes winner Mykindasaint. The price bettered the previous mark of $335,000. Stonestreet Stables LLC went to $210,000 for Hip No. 145, a daughter of Uncaptured consigned by Summerfield (Francis & Barbara Vanlangendonck), Agent. The bay filly, a half sister to stakes winner It’s High Time, is out of My Rolex, by Proud Accolade. Hip No. 128, a son of Commissioner consigned by First Finds, was purchased by de Meric Stables, Agent, for $200,000. The bay colt is out of stakes winner Lunarlady, by Yes It’s True, a half sister to graded stakes winners Lunarpal and Astrology. De Meric Stables, Agent for Backstretch Farm, purchased Hip No. 177, a bay filly by Into Mischief, for $170,000. Consigned by Select Sales, Agent, she’s out of She’s a Rainbow, by Giant’s Causeway, a daughter of stakes placed Rainbow’s Song. Hip No. 36, a son of Kitten’s Joy consigned by Woodford Thoroughbreds, Agent, also went to de Meric Sales, Agent, for $150,000. The dark bay or brown colt, out of Blue Grass Music, by Bluegrass Cat, is a full brother to Henley’s Joy, winner of the Kentucky Downs Juvenile Stakes on September 1st and second by a nose this past Saturday in Keeneland’s Bourbon Stakes (G3). H. H., Agent, went to $140,000 for Hip No. 69, a daughter of Take Charge Indy consigned by Summerfield (Francis & Barbara Vanlangendonck), Agent. The dark bay or brown filly is out of Divine Heart, by Divine Park, a half sister to grade one stakes winners Include Me Out and Check the Label. Hip No. 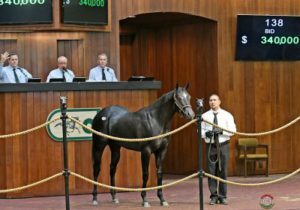 192, a daughter of American Pharoah consigned by Taylor Made Sales Agency, Agent, was purchased by First Stop Stable for $130,000. The dark bay or brown filly is out of Toast to Ashley, by First Defence, a half sister to stakes placed Moka Jumbie. Calumet Farm paid $115,000 for Hip No 195, a son of Lemon Drop Kid also consigned by Taylor Made. The bay colt is out of You Hear Us Coming, by Stormy Atlantic, a half sister to graded stakes placed stakes winner Quiet Meadow. Hip No. 153, a son of Kantharos consigned by Summerfield (Francis & Barbara Vanlangendonck), Agent, was sold to Tracy Farmer for $100,000. The chestnut colt is a half brother to stakes placed J Isle out of Orchid Isle, by Zamindar. For the day, 124 horses sold for a total of $5,464,000 compared with 115 yearlings bringing $4,959,400 at the 2017 Selected Sale. The average price was $44,065, up 2.2% compared with $43,425 last year, while the median was $30,000, identical to last year’s figure. The buyback percentage was 33.3%; it was 33.9% a year ago. Nine horses sold for $100,000 or more compared with six a year ago. The sale continues Wednesday at 12:00 noon with Hip No.’s 301 – 550 selling in the first of two Open sessions. The sale will again be streamed live via the OBS website as well as the DRF, TDN and BloodHorse websites. Current information about OBS sales, consignors and graduates is now also available via social media sites Facebook and Twitter. A link on the homepage directs users to either site.